The background was stamped using bleach on Papertrey Ink Enchanted Evening cardstock. I found the technique here. When the bleach started working, it bleached it to exactly the color of PTI Fine Linen. AAaahhh.... matchy-matchy. My friend Shawn would be proud. She's the queen of matchy-matchy. 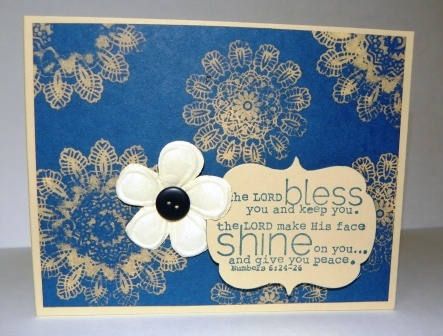 I used Unity Stamp Co/ Simple Stories Generations and Faith sets, Prima flower, PTI die and ink. I really like how flat everything is. This might actually fit into an envelope now!